Guess what? You probably didn’t realize this until this very moment, but you need borage. 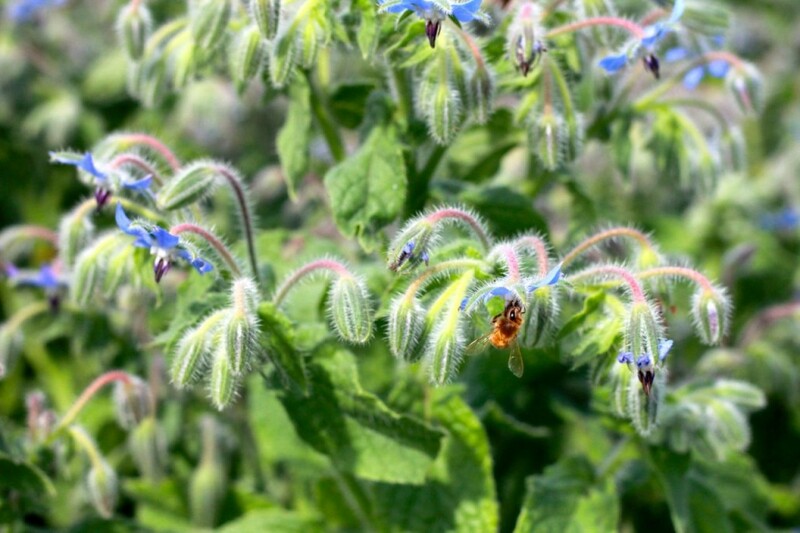 Your local bees need borage, too. But your garden especially needs borage, stat. And I’m going to tell you why all of this is true. Oh, but wait. Maybe you don’t know what borage is. Let’s start there, first. Borage (borago officinalis) is a freely seeding, easy-to-grow annual plant with delicious blue flowers, and prickly leaves that taste a bit like cucumbers. Borage is considered an herb, but is often grown as a flower. Borage is one of those plants that–once you’ve planted it in your garden–you’ll never have to plant it again (cue clap of thunder). Important Note: if control is very important to you in your gardening experience, then borage may not be the plant for you. If you garden, however, with a penchant and an appreciation for serendipity, and you like the occasional surprise, and you’re grateful for plants that pop up without your planting them, like borage, and mint, and dill, or whatnot, then it could be a great addition to your garden. 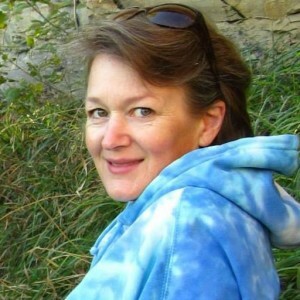 Speaking of serendipity: when I gave birth to my first daughter, Bethany, it was August. Finding myself in an intense nesting phase early in the summer, I had planted our back yard to an ambitious and beautiful (and probably too big, just guessing at that) garden. Then as the last weeks of pregnancy and the first weeks of new babyness left me without energy to tend it, my lovely garden succumbed to neglect. Stuggling a bit with postpartum blues, I wandered around my sad, unkempt garden, holding and admiring my baby girl and yet mourning my wreck of a garden. And then I saw them: the radish seed pods! My radishes had gone to seed, and they were a riotous mess of stems, flowers, leaves and little pods. I plucked a pod sadly, bit into it out of curiosity and . . . you’re thinking perhaps that I’ll say that my postpartum blues were cured. No, they were not, although that would have been sweet. But–I discovered that the radish seed pods were crunchy and delicious, tasting quite a bit like radishes (surprise!) and I found that they even made a nice addition to green salads. What–do–you–know!? That’s what I thought. I learned a lesson: even a neglected garden can yield sweet surprises, if you keep your eyes open for them. It is a treat to be able to actually keep up with a garden. But if Life Happens (as it so often does) and you have to let it go for a time . . . things will be okay. If I hadn’t let those radishes go to seed, if I had been all Control Freakish about the weeds and pulling up spent plants and so forth, I never would have discovered the serendipity of radish seed pods. And that leads us . . . back to borage. Naturally. Some folks might consider it a nuisance that borage so cheerfully pops up in the early spring, wherever the parent plants from the year before dropped their seeds, but I consider it a blessing. You can spot the big oval flat leaves immediately in the early spring, coming up in pairs wherever you had borage growing the year before. I actually let the plants grow until they are in the way of a melon patch or a corn bed or a radish row, and then I’ll pull them and throw them to my chooks. They eat every bite. Easy-peasy chicken food. There are always enough plants that come up on paths and in corners that I can leave to grow until they produce the achingly beautiful little blue flowers that gave this plant its second name: star plant. So let’s get to the reasons that you might just want to plant borage yourself, in your own garden. Then I’ll share with you how you can win some free seeds! Reason #1: You don’t see this shade of blue just anywhere. I have a particular fondness for the color blue in flowers. It seems unusual to see a blue flower, like blue ice cream or blue popcorn or blue cheese. It’s just different and a garden is an awfully nice place for the color blue. Just look. The perfect shade of blue. Reason #2: You can eat it. You can take great delight in eating flowers as you go about your gardening chores. And the leaves make a very refreshing tea. You can also go a bit Victorian and dip the flowers in whipped egg whites and then sugar, and decorate cupcakes or birthday cake with them. They would look absolutely stunning perched atop glazed petit fours. Everybody will applaud. I’ve seen it. The younger leaves are tasty in salads, and shredded in soups. Reason #3: Borage flowers are bee magnets. 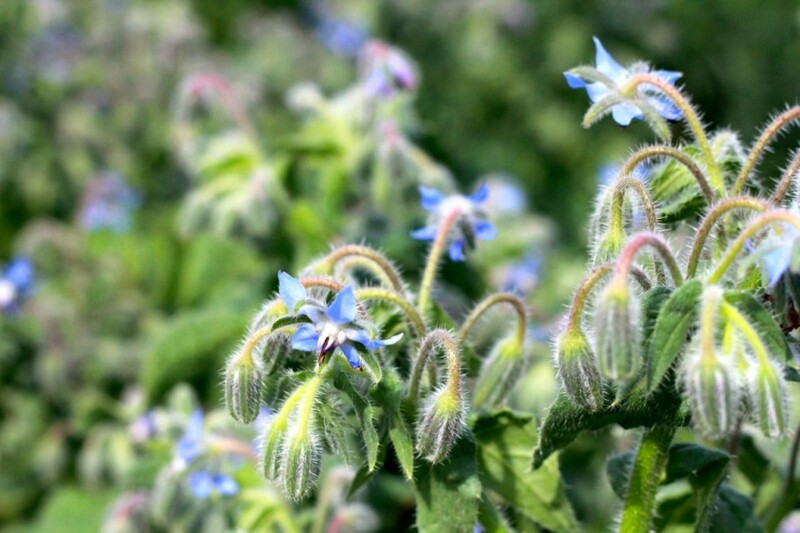 This is a great reason to plant borage in your vegetable and flower gardens. Although it can be a gangly plant, and will invariably flop over and die at the most inopportune times (late summer, when the pressure to have a gorgeous garden is highest, or just before somebody you want to impress comes for the weekend) the bees love it. And I’ll do nearly anything to help the bees out in their current, struggling-to-survive-state. Many vegetable plants, too, that need pollination in order to be fruitful, do not have showy flowers, so these little intensely blue flowers attract attention from the bees like nobody’s business. The day I was taking these pictures, the bees were quite busy in the flowers. Reason 4: It’s a great companion plant for strawberries, squash and tomato plants. Haven’t heard of companion planting yet? Here’s a bit of info for you. Reason 5: Borage deters tomato hornworms and cabbage moths. And who doesn’t have problems with cabbage moths? Everybody I know (and their dog) have problems with cabbage moths. I’ve always wondered why I never see tomato hornworms in my garden, and maybe this is the reason. Anecdotal, I realize, but there it is. I’ll take it. Reason 6: Borage oil is the richest known source (24%!) of an essential fatty acid called gamma-linolenic acid (GLA), found in its seeds. Of course you would have to eat a lot of the seeds to get the benefits of this oil, but you can buy borage oil and lotions online or in health food stores. People with skin disorders such as eczema, atopic dermatitis, and psoriasis show increased levels of linoleic acid and a simultaneous decrease in gamma-linolenic acid. This decrease can cause serious skin problems. Recent studies indicate that borage oil, taken orally, increases PG1 levels in the skin and suppresses chronic inflammation in those who are afflicted. Learn more here. Reason 7: Mulch. The borage plant grows quickly, flowers riotously, and then when it’s tired, will flop over and beg to be pulled. It’s an easy plant to pull, and then you’ve got yourself an armful of mulch. It’s a big plant. You can lay it in the path of your garden where it can decompose and add organic matter to your soil, or toss it in the compost. Either way, you’ll improve your garden soil. Almost without effort, too. Win-win-win. There they are! 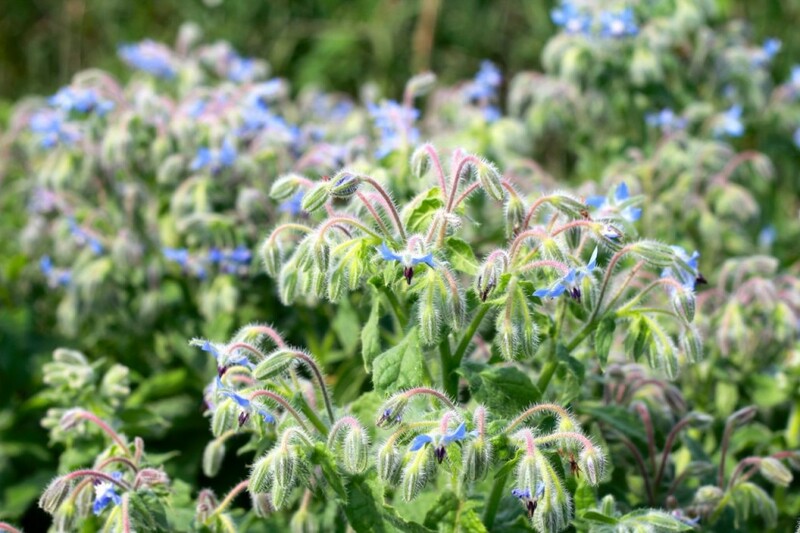 7 excellent reasons to plant borage in your garden. And guess what. You can plant it early in the spring, or you can plant it now, or you can even scatter seeds in the fall, and they’ll come up in the spring. There are many places you can purchase borage seeds, but I’ll do you one better: if you have time to wait a bit, little Mack and I are going to collect borage seeds, and you can enter my borage seed giveaway! I’ll choose ten entrants to receive free seeds from my own borage patch. Cool, huh? testing . . . testing . . . 1 2 3 . . . I found one tired borage plant last year at Co-op & promptly killed it. This year I planted seeds in a pot & I’m hoping for success!! I love plants that reseed and are multipurpose. That would be a lovely addition to my growing garden. I’m sold! I would like to give it a try. I love flowers in the garden among the veggies and those that grace us without help are especially fun. Agreed! And if you let them go to seed, you’ll have plenty of little plants next year and the next . . .
I’ve never grown borage, but I would like to try it. Going to be getting chickens soon glad to hear they will love it! It’s a wonderful plant, Jillian! Ok, so you’ve convinced me. I’ll stop pulling all those little borage plants out and let some grow. I was afraid it was going to totally take over Eliza’s little garden. We’ll see if our chickens like it as well as yours do! Have you written a blog post about Pimms, Anita-Clare? I’d love to learn how to make it. I’m always looking for stuff that helps the bees!! I’ve been growing borage for 18 years now and love it’s blue color but have never tasted it. The “furriness” of the leaves have been off-putting, but the idea of adding them to iced tea, if cucumber flavored, (or even water) sounds delightful. Thanks for the inspiration! Gwendolen, Such a lovely Victorian drink: ice tea, ice water, or lemonade with plenty of ice all are made better with a few small borage leaves or a handful of flowers. And such a beautiful drink! Try this: put a handful of the smaller borage leaves and a few flowers in a tall glass of lemonade, or ice tea, or ice water. Beautiful and refreshing, too! Borage is essential to a garden and to Pinms in particular! Now I’m going to have to figure out what Pinms is, Caro . . . ! I grew borage in Arkansas, when I had 34 acres, two large gardens, chickens, and lots of room,s. I haven’t grown it in all the years since I returned to my native New York State. I don’t know if they would reseed in our community garden and they take a lot of room but they do have those beautiful blue flowers I miss. I would bet they would reseed, Alana. My hubby plows up my garden every fall, and then my dad rototills it afresh in the spring, and still my borage comes up every year. So glad about it. I need to do some more gardening! Have not planted borage before. Maybe you will be, soon! I love it – that you grow borage. Originally, I planted it in the tomato beds to – yes – discourage tomato hornworms. When it finally succumbed to the heat of the Texas summer, I was so sad. What thrilled me, though, was the new little babies that sprouted up all over. My chills turned to thrills when I saw them come up. Now the tomato beds have borage all over in them. I love it. I hope that some day the bases of the tomatoes will be plumb stuffed full of this flower/herb. It is gradually making its way toward doing that. I, too, am looking to draw in the bees. As I survey my garden, I am always looking for the plants that draw the bees. When I see that I have enough to sustain the bees, I will bring in the bees. I just want to be sure there is enough to sustain them. Another plant that the bees just go crazy for is lamb’s ear. When they bloom, they just teem with the busy buzz of the bees. They also self seed all over so I find it in every nook and cranny of my garden. Wonderful, says I. They are beautiful and they keep the bees coming to the garden. Between lamb’s ear and borage, my little pollinators are jumping for joy. I just hope they have enough time to pollinate my veggies! I am not aware of it growing in my garden…I didn’t purposely plant it. If you had it, Sena, you’d know it–it’s a BIG plant, getting to be probably 24″ tall or more, and at least that wide, too. I have never grown borage but now I’m looking forward to it! Well I did enjoy the first six reasons, because like you, I want to do want ever it takes to help the bees. As for spreading it along the garden path, I am afraid it will become like our mint, which has a plan of it’s own to take over the world. However, on behalf of the bees, I will add it along the walkway mixed in with our 20 or so sunflowers, which we plant each year for the finches. Borage is not as invasive as mint! It does spread seeds lavishly, but it doesn’t send out runners like mint does, so I welcome it into my garden. Not so much mint. I’ve got several kinds of mint, but it is banished to the far corners of the garden! Love the blue flowers and we’re going to have chickens as soon as the coop is built – a win-win-win to me! Yaaay! Good for you! 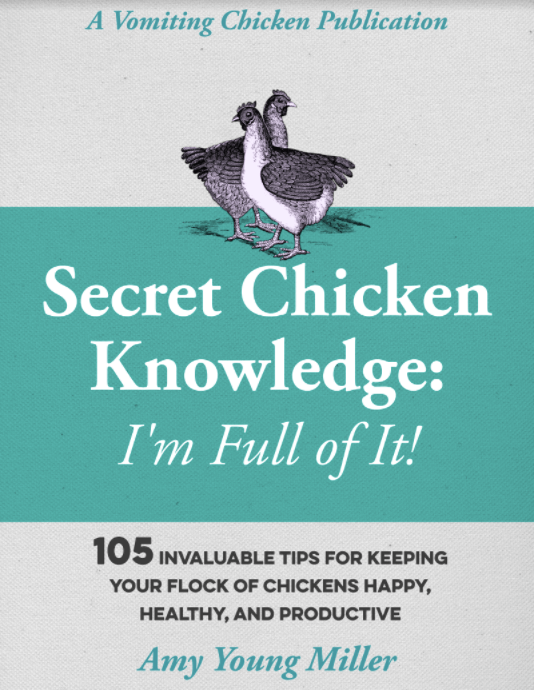 Blessings on those new chooks of yours! No, I have wanted to but can never find any plants. Yes, we have (and do!) grown it! However, I’m a gardener by profession but I’ve not grown borage so far but after knowing the properties of this herb, I’m definitely going to plant it in coming spring season. Oh, John, what I’ve learned about borage: once you plant it, you will always have it. It self-seeds freely. I see the fat furry leaves coming up and rejoice every year! I have enough come up in my garden now that I pull some for the chickens, and leave others for me. If you catch them when they are tiny, also, you can move them to a place where you actually WANT them. Just a tip. Thx for your reply. I have an acre of land and I can have lots of them come up. Its a natural bush block anyway. indeed, John! I let the borage plants that I do not want to keep grow to a good size, then I chop them down and toss them to the chickens! First timer reading your blog because I just bought a borage plant today at an herb society sale and wanted to know more info on it. It caught my attention because the lady said the leaves taste like cucumbers. I live in south Louisiana and was wondering if it required any special soil or fertilizer. I will be planting it in a container since all I have is a balcony to grow my garden. Any info will help. Thanks! Jessica, I don’t think it needs any special soil or fertilizer, but it’ll probably need a bigger pot than you’d imagine. The plants can get quite large! Watch your borage plant and it will probably tell you what it needs. I’d pot it up as it gets bigger, and fertilize it once a month using a standard balanced fertilizer. I’d love it if you’d reply back with how it gets along. I’ve never grown borage in a pot before. Oh boy, Eve, I wish I could help you! Here’s a pro tip: Borage freely drops seeds at the end of its life cycle. If I were you, I’d go back to that cafe and ask if you might gather a few seeds (they’ll be in the dried-up seed heads). Borage is not difficult to raise from seed! And once you grow it one time, it will come up freely the next year in the same spot, from seeds the mother plant dropped the year before. I have seen pink borage flowers on my own borage plants, but never white. I’d love some seeds, myself!